We have released an enhancement to Accounting in ApnaComplex. Most societies have a need to ensure that accounts are not “modified” unintentionally (or intentionally) once the accounts are audited and approved by the general body. To meet this need, your favorite software now supports “freezing” (or closing) of accounts for a given accounting period. Go to Accounting->Accounting Periods and click the “Close Accounting Period” which will lock all transactions of that period. No one (even community admins) will be able to make any changes to the transactions once the accounting period is closed. You have to make a special request to Support team to “unfreeze” an accounting period. This provides an inherent safety net ensuring no changes to the accounts once they are approved in AGM by the general body. Continuing with our philosophy of continuous, incremental enhancements – Administrators now have a setting to control if members can post Community Complaints (which is enabled by default). When disabled, members will only be allowed to post Personal complaints. Go to Complex->Settings to see this in action. Configure ApnaComplex to suit your society needs better! A housing society needs special fire safety measures and this is mainly because it houses many flats or houses, within one or multiple buildings. People share common areas and amenities such as club-houses, lifts, play and parking areas, pools, and terraces and the threat of a fire breaking out will always be high unless proper measures are taken. One of the biggest challenges faced by a housing society is the danger of a fire breaking out. Since these societies largely comprise of many flats that are built next to each other in order to achieve maximum utilization of space by commercial builders, exit routes in some cases are not clearly defined or sufficient for the large number of residents involved. The primary aid in case of a fire, therefore are fire-extinguishers, and a housing society needs to invest in appropriate fire-fighting mechanisms for the safety of its residents. The choice of the appropriate fire extinguisher depends on the class of fire, which is based on the nature of the fire or the material involved in the fire. There are six classes of fire, ranging from classes A to F.
In Class A, the surrounding material near the fire is primarily solid, like paper, plastics, and wood. Class B fires involve flammable liquids like petrol, paraffin, and oil. Class C fires are fueled by flammable gases. In Class D, metals are the items that are burnt. Classes E and F are fires that occur around electrical apparatus and cooking fats and oils respectively. Depending on the class of fire, i.e., the materials that are directly involved in the fire and the materials in the surrounding areas, the appropriate extinguisher has to be selected and used. Water fire extinguishers are mainly used for Class A fires, but they are unsuitable for Classes B and E. Foam fire extinguishers are versatile and safer to use but more expensive. Fire extinguishers need to be placed in strategic and easily accessible locations. Residents should be made aware of them and some volunteers may be trained to use them, on each floor and block of the housing society. Fire extinguishers need to be checked from time to time for their efficacy. Mock fire-drills are important in educating residents about evacuation and safety in case of fire, especially in high-rise buildings, where lifts are generally closed when the fire spreads. The need for fire management has become an integral part of every housing society, and this is especially true in a housing system where hundreds and thousands of people reside in close quarters. Effective safety measures including actions or precautions should be adopted in a housing society in order to forestall any hazards or accidents and make sure that no residents are harmed, or even the buildings for that matter. Fire safety measures should be taken when a housing society building is being constructed; steps should be implemented to protect the structure while the building is standing; and general safety tips need to be taught to all residents in order to train them for emergencies. Your housing society buildings should conform to the local building code. The upper limit tenancy within any part of the building should not be exceeded. Fire suppression systems should be installed (like sprinkler systems), and fire hose reels, fire hydrants, and fire extinguishers need to be provided. The residents of the housing society must be given lessons on how to use fire extinguishers and fire hose reels. Fire extinguishers should be placed in easily accessible spots so that the occupants of the housing society know about their location and can easily access it at the time of need. Fire extinguishers need to be checked and maintained on a monthly basis by the maintenance crew. Automatic fire detection and alarm systems (smoke detectors) should be installed on all floors and these will inform the occupants about the impending danger ahead of time and they will be able to evacuate the building without any mishap. The maintenance team should ensure that all alarms are free of dust by regularly vacuuming over and around them. They should replace the batteries in smoke alarms regularly. Proper exit signs should be installed as these will help the occupants to act quickly in case of a fire. Smoke exhaust systems can be installed on every floor as they help in minimizing the accumulation of smoke in case of fire, which could be quite dangerous and life threatening. Hazardous materials should be stored very carefully as they are most likely to catch fire within the building. Flammable materials should be monitored within the building. One of the important steps is to conduct fire drills throughout the year. Once this is done in a regular manner there will be less chaos during an emergency. The housing society management can conduct fire safety education programs for children during the weekends. Failure to meet these safety measures will significantly affect the levels of fire safety in a housing society building and can compromise on the safety of the occupants. You can also work towards maintaining a fire safe housing society by following these small tips. Be careful about smoking near combustible objects. Don’t store combustibles near equipments that emit heat, sparks or flame. Maintain all electrical wiring in good condition. Maintain your heating and cooking appliances. Once these safety measures are followed, the housing society will be truly protected against sudden mishaps and accidents. Thanks to Mr. Srinivas A, one of ApnaComplex well-wishers, we learnt about Bangalore Graduates Constituency Election to be held sometime around May 2012. Here is gist of what we gathered in Q&A format. Q: So, why are we talking about an 2012 election NOW? A: Simple – the voter registrations for this election will be closed by November 5th 2011. Hence the urgency. Q: So what? I am already enrolled as a voter, have a voters card and have even voted earlier for our assembly elections. A: No. The regular voters card will NOT be valid for voting in Graduates Constituency Election. You need to follow a separate enrollment process. Q: Really? How is this “Graduates Constituency Election” different from other elections? A: For a “Graduates Constiutency Election”, only a subset of pouplation are eligible to vote. Only Residents of the constituency who hold a college degree from any recognised University in India, which they received at least three years ago are eligible to vote. Basically, this is an exclusive opportunity for educated population to make a difference by electing deserving people to our legislature. Q: Ok, you got me interested. What should I do to register myself to be able to vote in 2012 elections? 1. Download Form-18, print it and fill it. 2. Make a copy of your degree certificate AND address proof (such as Ration Card, regular Voter ID card, passport, driver’s license, electricity bill etc.) and self-attest them. 3. Go to your nearest BBMP office and submit these documents (take along the original degree certificate to be validated by BBMP staff). Do note, you can submit the documents of all your family members as well. Here is more detailed FAQ. 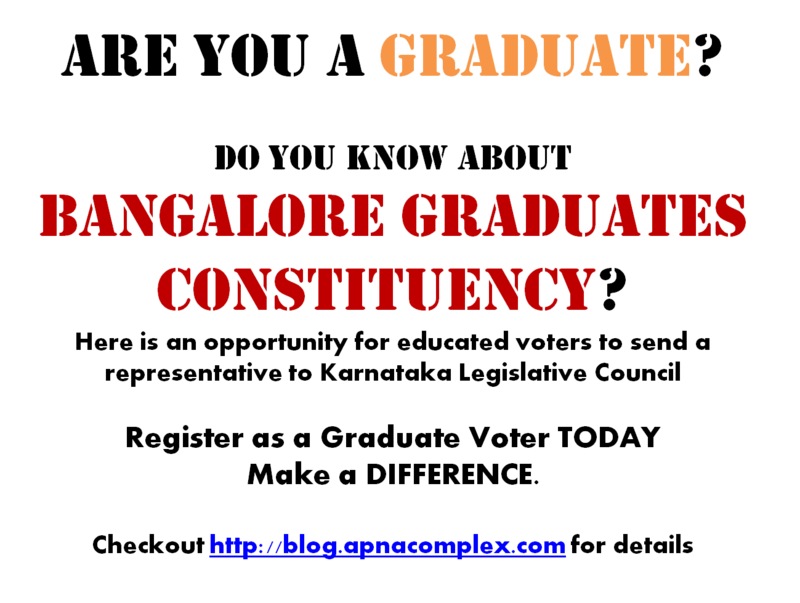 We would encourage ALL graudates in Bangalore to register themselves to be able to vote when the elections happen. Since the time is short, we encourage all resident welfare assocaitions to run campaigns in your complex/layout. As a part of your campaign, if you need any help with respect to having the form-18 available etc. do drop a comment below and we would be glad to co-ordinate. You can download the Register to Vote Poster, print the same and post the same in your society’s noticeboard. Please ensure you add a volunteer’s name from your society after printing.